buy now When a natural disaster hits, the country often swoops in to help. Volunteers, supplies, and financial aid are all offered. But what happens when time has passed, the news media has left, and you still don’t have your house or life back? cheap generic viagra mail order pharmacy Enter International Relief Teams. International Relief Teams (IRT) is based out of a small office in Grantville, but works with partner organizations in the United States and all around the world. Since 1988, IRT has delivered $372 million in humanitarian aid to 68 countries and deployed 6,621 volunteers in relief efforts. This year, that included construction trips to Louisiana for flood relief. But wait, wasn’t that state affected by superstorms and floods years ago? Yes. IRT’s mission statement is to “alleviate the suffering caused by poverty and disaster around the globe, from the forgotten corners of the world to right here at home … to improve the lives of those who suffer most.” They wade into a disaster area about a year after the event has occurred, after federal aid has come and gone, after insurance files have been claimed — and help those who still don’t have a home. “We help the people that fell through the cracks,” said Chris Read, construction team leader and IRT board member. In 2016, rain poured down on Baton Rouge — 20 inches in eight days. The floods didn’t even get a name, yet they destroyed more than 140,000 homes, businesses, and schools, leaving tens of thousands of people without livable housing. IRT came in in 2017 to help rebuild the homes of those who didn’t have insurance, didn’t qualify for federal aid, or got scammed by contractors. “It’s been almost two years since the floods and many families are still homeless, living in damaged houses, or FEMA trailers. Our volunteers are committed to give their time and skills to restore the homes of the families that were affected by this natural disaster,” said Brett Schwemmer, program coordinator at IRT. Since their arrival, the IRT groups have helped rebuild 76 homes in the area. Two of those people were Juan and Rina Aguirre, who will finally be able to go back to their house after almost a year and a half of living in a FEMA trailer. IRT brings this hope through partnership with the Louisiana United Methodist Council on Relief and Catholic Relief Services. One of the keys in IRT’s massive effect is working with organizations already set up to help – groups already working “boots on the ground” so to speak. IRT founder Barry La Forgia emphasized that the point is not to get IRT’s name noticed. The point is to meet the greatest need with the resources they have. The council in Louisiana has already done the case work. They vet the families and find the ones that need IRT’s help the most, arrange the materials, and often provide housing through one of the local Methodist churches. IRT provides the labor, both skilled and unskilled, but always eager to work. 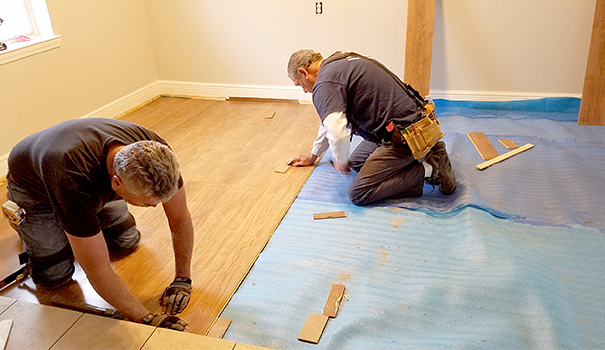 The construction teams are often putting the final touches on the homes they are rebuilding — drywall, flooring, cabinets, trim, etc. Most of the time, the teams of 10-20 are split up into several projects at once. Although they work hard — this is not a leisurely vacation — the teams know how to play, too. IRT will be wrapping up their work in Louisiana this upcoming year, and starting to focus on the areas in Texas affected by Hurricane Harvey. They are continually looking for volunteers for the weeklong trips. Read notes that a construction background is not necessary. 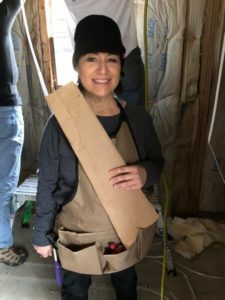 There is a significant amount of on-the-job training and the craftsmen team leads “have a lot of patience,” so the most important factor in a volunteer is attitude. “People just need to bring themselves, a willing attitude, and a sense of fun — and we’ll take it from there,” Read said. If a weeklong trip across the country is not available, IRT is also seeking help for its one-day house builds in Tijuana, Mexico. Through a program called “New Homes, New Beginnings,” IRT has already built seven homes and one school room for impoverished families in the informal settlement Fuentes del Valle. For more information about IRT or to volunteer, visit irteams.org or contact Brett at 619-284-7979 or bschswemmer@irteams.org. — Freelance writer Joyell Nevins can be reached at joyellc@gmail.com. You can also follow her blog Small World, Big God at smbgblog.wordpress.com.